This 2-year resident program is ideal for a student who is intent on becoming a Scenic Artist or for Design Students or Designers that want to become proficient scenic painters. This program offers the balance of technical skill-building, classwork and valuable portfolio-building apprenticeship-style training. Cobalt Studios is known throughout the industry for sending productive and skillful graduates into the workforce as professional Scenic Artists. The 2-year program starts every other year. The current class begins in September 2017 and will graduate in May of 2019. * This application fee is non-refundable and is NOT included in the tuition for this program. For more information on costs, see the Student Information document at the bottom of this page. Revolving. It’s never too early to apply for this program! While a basic familiarity with Theatre and Art is necessary, applicants need not have an extensive Theatre or Art background. Admission is based on applicant’s career objectives, abilities, references, and their foreseeable potential in professional theatre rather than in the customary academic standards, although applicants must be high school graduates or have equivalency certification. The application consists of a small fee, an application form, references, transcripts, and an overnight interview and portfolio review. Call 845 583 7025 to ask for an application. Upon acceptance, registration is completed by payment of tuition, fees, and deposits. Coursework and training is generally 7-8 hours a day during the hours of 8 am and 5 pm Mondays through Fridays. Evenings and weekends are unscheduled. There is plenty to do in the area or nearby. The training at Cobalt is a combination of traditional apprenticeship systems and coursework. Each student’s proficiency is assessed at the beginning of the program and the curriculum is adjusted to maximize the learning experience. 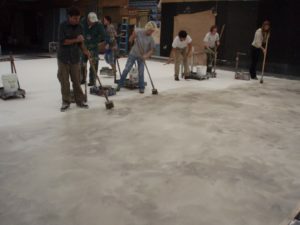 Students work directly with highly experienced scenic artists, either our resident staff or the industry professionals who teach our Specialty Pro seminars. 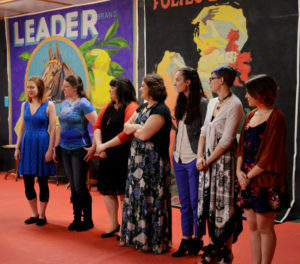 Rachel Keebler, Master Scenic Artist and the school’s co-founder is the primary instructor for the academic year. During the year,the students participate in the Specialty Pro Seminars that Cobalt offers to the public. These seminars offer the SATP student the very unique opportunity to not only study a specialized craft from an industry pro, but to work alongside other scenic artists from around the country that are enrolled for the seminars along with them. Upon completion of the course a student will be: well versed in the technology of paint; well-practiced in layout and paint application techniques; and well aware of the management skills and attitudes necessary to successfully complete a professional job. 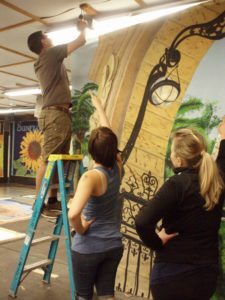 Students are taught techniques by example and then they execute them first on their own individual projects and then by working as scenic artist trainees on Cobalt’s commissioned projects. Students work directly on drops that will be used in legitimate theatre productions. This work may be added to their individual portfolios. Graduates leave this program with confidence, knowledge, skills, quality craftsmanship, and a portfolio that can propel them into a self-sustaining scenic painting career.